Sonic Free Riders is a cautionary tale about the importance of controls in gaming. Make a game interesting, give it solid graphics and some unique hooks, but don't lock down the controls and you're going to have a disaster on your hands. 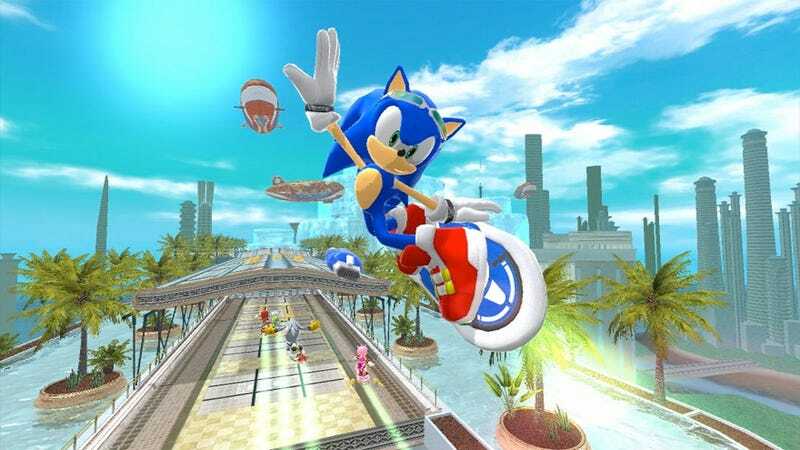 Kinect-enabled Sonic Free Riders is the third in the Sonic Riders series which has you hoverboarding your way through courses against a clock or other popular Sonic the Hedgehog characters. You lean forward and backward to steer, as if standing on a snowboard, and mimic kicking off on a skateboard to speed up. You can also grab items with your hands and use them against your opponents. Sonic the Hedgehog fans who continue to be okay with the concept of Sega's mascot riding something, rather than running on his fast little feet. Players tolerant of frustrating controls and user interface... and Sonic's friends. This is our first look at Sega's attempts at making use of Microsoft's controller-free Kinect. It also delivers one of the few racing games to the casual-heavy Kinect launch line-up. Does Kinect make the Sonic Riders games any more fun to play? Not really, the series' long-standing issues with loose controls are only exacerbated by the Kinect's inability to keep track of what you're doing and translate that into a semblance of control on the screen. I spent a healthy chunk of nearly every race with my hoverboard nose-first in a course's retaining wall. My weak control of Sonic, Tails, Knuckles and crew also often led to them randomly switching stances and ignoring jumps. How are you supposed to control the game? The idea is that you stand in front of your television at a slight angle, with one shoulder facing the TV and the other the wall behind you. You bend forward and backward to turn, jump to jump, and swipe your foot at the ground to perform a kick dash. You can also hold out your hands to grab things, face forward to break and switch stances by facing in the opposite direction. The game includes items that you can pick up and use during a race as well, like tossable tornadoes and giant bowling balls. The core concept for the moves are solid, but the game has a pretty high rate of completely missing what you're doing. Maybe it needs better calibration? Perhaps, but Sonic Free Riders has you doing more calibration than any other Kinect game I've played. Before every single race you need to go through a quick set-up that has you slowly weaving your board between a set of cones. It never seems to help. The game's light story is presented in a series of still images with spoken dialog. OK, so there are control issues, but what about when the game works? Sonic Free Riders offers an impressive collection of modes and ways to play the game. The World Grand Prix, the game's mainstay, has you controlling one of four teams as they race to unlock tracks and modes. But there's also the ability to do tag-team races with a friend, relay races and play online. And the races aren't all on hoverboards, you also get a chance to do some races on a bike, which controls much better than the hoverboard. If the controls worked, this could be a great game. How does Sonic Free Riders compare to the Kinect's other racer, Kinect Joy Ride? Sonic Free Riders has a lot more substance and the graphics and presentation are better than Kinect Joy Ride, but Joy Ride works. Is it really that bad? Yes, even the menu system is a mess. I can't think of the last game I played that almost stopped me cold because I wasn't able to select the option to start playing. Does Sonic Riders have anything going for it? If Sega can patch the game to fix the major issue with controls, this could easily be the sort of game players could sink a lot of time into. There are a lot of neat touches found in the races, like multiple routes, the ability to go over and around the main course. I love that the game lets you reach out and interact with the course as it zips by and performing tricks when you're in the air can be a lot of fun. But it all comes crashing down every time the game fails to recognize a turn, ignores a jump or refuses to let you use an item. Sonic Free Riders was developed by Sonic Team and published by Sega for the Xbox 360 Kinect, released on Nov. 4. Retails for $49.99. A copy of the game was given to us by the publisher for reviewing purposes. Played through more than a dozen races and modes. Tried single and multiplayer races. Struggled mightily with the menu. Attempted several recalibrations to improve the control issues.